‘O purpo se coce ‘int all’acqua soja. 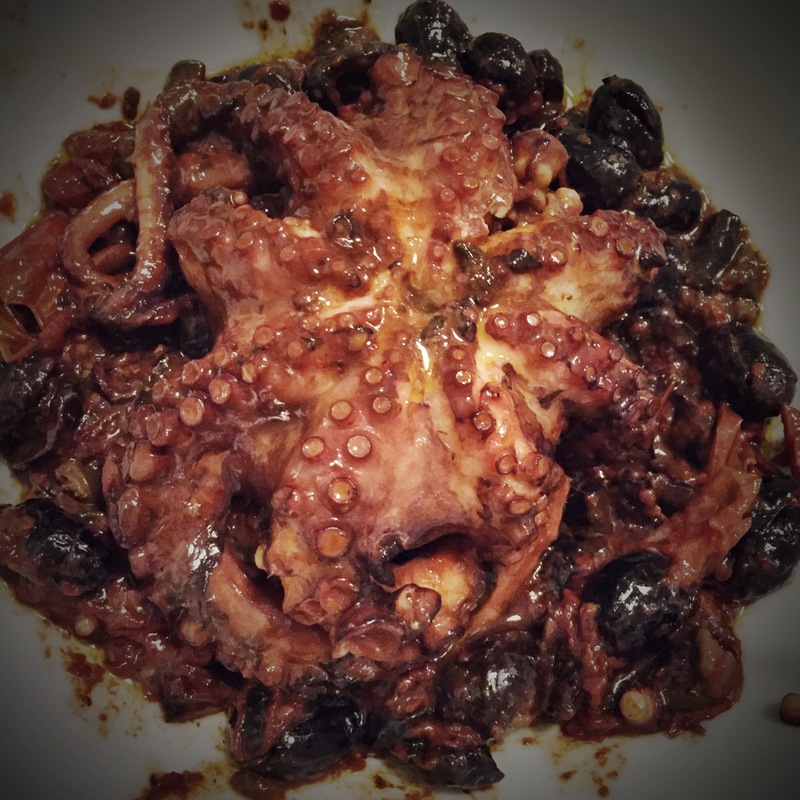 Il polpo si cucina nell sua acqua. You’ve made your bed, now lie in it. I can think of a few people I’d like to say “‘o purpo se coce ‘int all’acqua soja” at the moment! But I can’t. So instead, I’ll cook out my frustrations by preparing some delicious and super easy to make Polpo alla Luciana. It’s a traditional dish from Saint Lucia, near Naples, where fishermen would go down to the sea with small earthenware jars. These jars were placed well hidden into the sand and left for a few hours. When they returned, they would be full of octopi! They’d then take them home where their wives would cook a dish fit for a king! 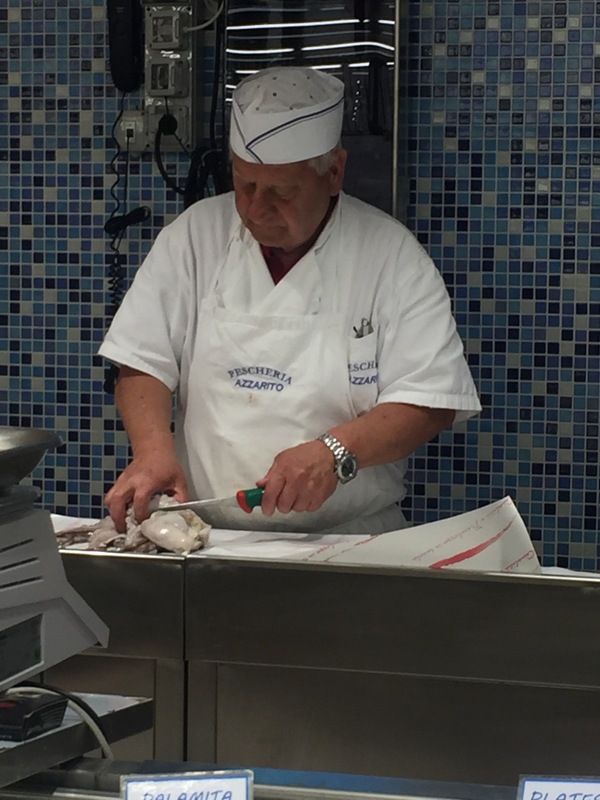 Reason #10256 that I love Italy, is the fresh seafood counters are always a million times better stocked and more inspiring that those back in the UK. I don’t think I’ve ever seen fresh octopus in the UK. You don’t eat the best fish at the seaside, but in Milan. Milan became the center of commerce for northern Italy way back in the Middle Ages due to the vast network of canals and, at one point, the landlocked city was among the largest ports in Italy in terms of tons of cargo that passed through it. Due to this, Milan is still where most fresh seafood is flown out of Italy to the rest of Europe.These days, what still commonly happens is that the fishermen will split their catch into two. One half will go to Milanese markets, fetching a nice price, and the other half will go to regional markets, in order to maximise profit. So back to my polpo. I prefer to buy one big octopus, but you can make it with a couple of smaller ones if you prefer. 500g of octopus is about right for two servings. 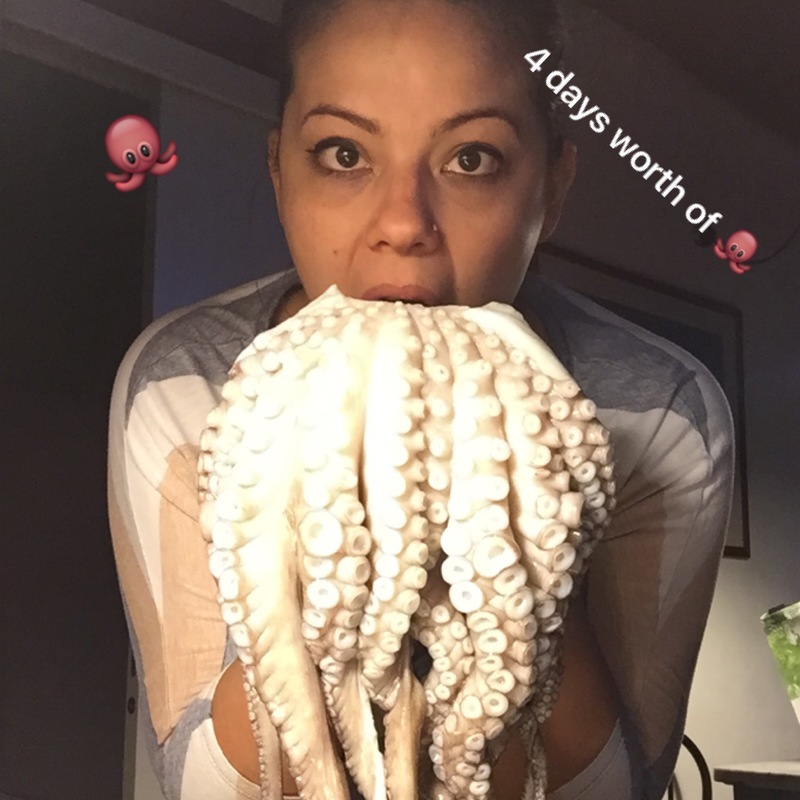 I once made the mistake of buying a 1 kg octopus and was eating it for days! First clean it, taking care to wash the tentacles properly to rid them of sand, and remove everything from inside the head cavity (the fishmonger – pescivendolo – will probably do this for you if you ask nicely – it’s pretty gross), then remove the eyes and the ‘beak’. Check out this video to show you how. You then need to batter it within an inch of it’s ‘life’. I don’t have a special kitchen mallet so just used the bottom of a glass. Pay special attention to the tentacles, beating them properly will ensure a much more tender meat when cooked. Then fill the (now empty) head cavity with a clove of garlic, a couple of olives and capers, and some parsley and close using a toothpick – or if you don’t have any like I didn’t, sew up with a needle and thread like the great octopus surgeon that you are! Add the rest of the olives, capers and the cherry tomatoes to the pan around the octopus, and then cut a sheet of oven paper (carta da forno) to put over the pan, and put the lid on top, to trap in the steam and let the octopus cook in its own water. Leave for about an hour, checking at around 45 minutes, it might be necessary to add a touch more water. When cooked, you should be able to easily insert a skewer into a tentacle. Serve with fresh bread or use to dress some fresh pasta. I’ve never had octopus before, but the way this article is written makes me want to try it. It sounds delicious! I love octopus, it’s delicious!